Lost in meditation is creating some fantastically tenuous links, and here is another one. 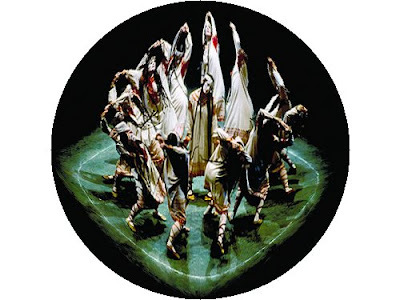 The Joffrey Ballet's 1987 production of Vaslav Nijinsky and Igor Stravinsky's The Rite of Spring used the original sets, costumes, and choreography from the 1913 production. In the image above I've used electronic trickery to turn the Joffrey production into an ersatz mandala. Because Nicholas Roerich, who co-wrote the scenario of The Rite with Stravinsky and also designed the sets and costumes for that first production, was a celebrated Tibetan scholar. And there are more fantastically tenuous Buddhist links to Stravinsky. The wife and daughter of Ernest Ansermet, who was a celebrated conductor of Stravinsky's music, were both ordained as Buddhist nuns. Read the whole story in an Overgrown Path exclusive. - becomes square in my ersatz mandala, while the rest of the image becomes a circle. The subject for a koan perhaps?